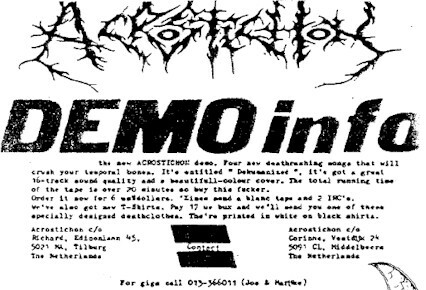 Acrostichon from Tilburg, Holland was formed in August 1989 when Jos (guitar), Richard (guitar) and Corinne (vocals) found a rehearsal-room and a drummer (Vincent). 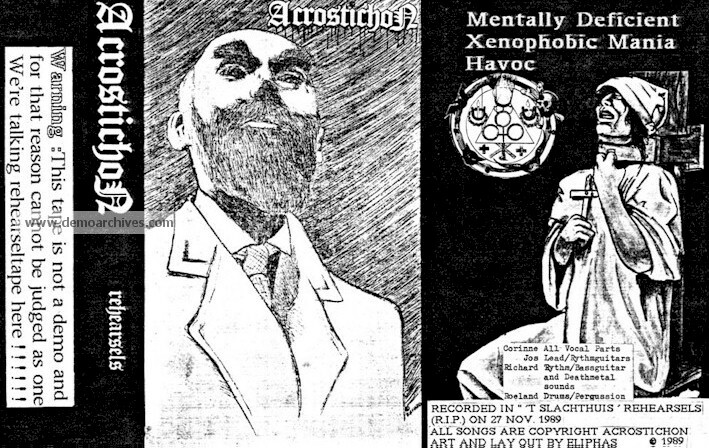 In those days Acrostichon played some songs of Richard's old project: United Brains ("Mentally deficient" and "Havoc"), and the first Acrostichon songs were written ("Xenophobic mania", "Immolation of the agnostic", and "elaborate ritual"). In November 1989 Vincent was replaced by Roeland and in this lineup Acrostichon played their first gigs. 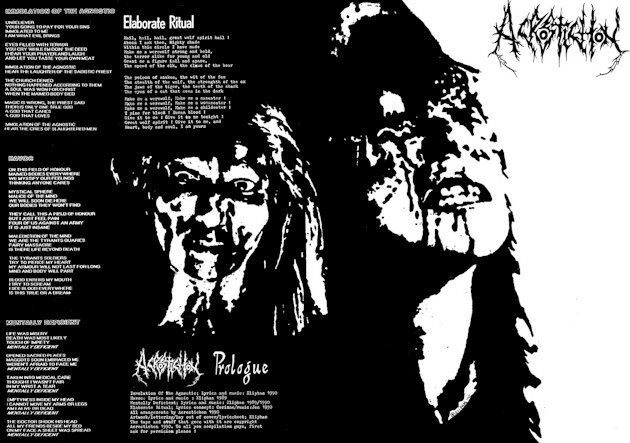 In March 1990 Acrostichon recorded their "Prologue" demo. The demo got great reviews and the band sold about 500 copies of it. The demo also made it possible to do more and bigger gigs. 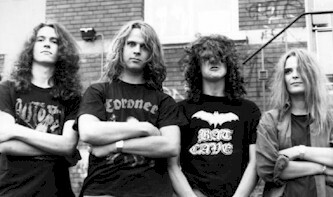 In June 1990 Serge replaced Roeland, and in this lineup recorded the second demo "Dehumanized". This tape contained four new tracks. 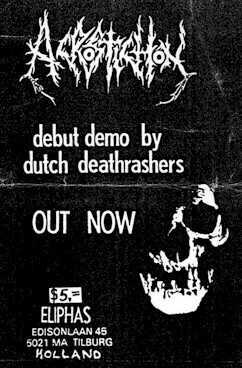 This demo was the final breakthrough in the Dutch underground scene. More than 1000 copies were sold. Songs of the demo were featured on the "Where is your god now" LP published by D.S.F.A. Promotions. Also, a 7" was released by Seraphic Decay Records. After that, there were some labels interested in signing Acrostichon, and Acrostichon signed with Modern Primitive Records. 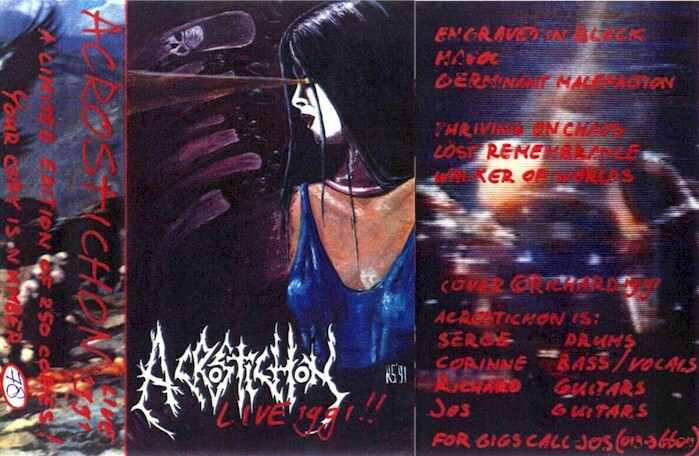 In March 1992 Acrostichon recorded their debut album, called "Engraved in Black", with producer Colin Richardson. The band would later become Outburst. Official Live Tape recorded live from "Chateau" in Tilburg, Holland. Xeroxed covers. Regular Tapes.